It's over six months since the tsunami crisis, the tragedy that shook the world. Sri Lanka had the worst casualties but there were also many areas affected in Thailand including its most famous tourist island Phuket. However, people are re-building their lives and the best way to help is to go there and spend your money. But where to go? Where to stay? What to do? 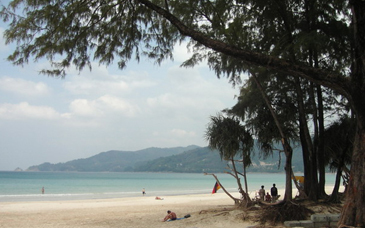 There are less people in Phuket now which isn't necessarily all bad - there is room the breathe and the beach is all yours. Less hectic and totally relaxing - isn't that what holidays are supposed to be all about? Here are some ideas for your adventure. Vent your bargaining skills and pop down to the old markets to haggle away the afternoon. Good value purchases are bamboo or Thai silk bags, costume jewelry, CD 's, DVD 's, handmade wooden vases, sculptures or utensils, Thai silk cushion covers and scarf 's, and colorful beaded slippers (if you have small feet – size eight need not apply). In low season there can be up to 50 percent discount on many products for clearance and even if you hate shopping, the markets are always where all the action is. If you're hungry you can go to the food market and pick up some satay sticks or spring rolls for a snack, or recoil at the fried insects, the smells are sure to draw you in. Just get a taxi, it's a well trodden area and easy to get to. Some may say it's tacky and over the top but Patong is an eye-opener if nothing else. The main foreign zone attracts all walks of life, but is far from dull. Lady boys glamed-up in glittery dresses, patrol the street ready to pose for photos, as with the other ladies of the night (no posing for photos though), old men with young women prevail, in a mix of market stalls and party bars. Go and see it for yourself, then head home and pour yourself a drink. Just follow the convoy of foreigners and you'll find it. 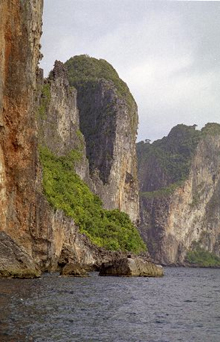 If you go to Phuket, take a snorkeling tour to Pi Pi. A full day of cruising on a speedboat, snorkeling, fishing, and a leisurely lunch on Pi Pi Don by powdery sands. If you get a calm day the speedboat is relaxing and fun and you may even spot some dolphins flitting in and out of the azure waters. The array of tropical fish in the sea is abundant and it's a great way to whittle away an afternoon - smitten by an underwater world. 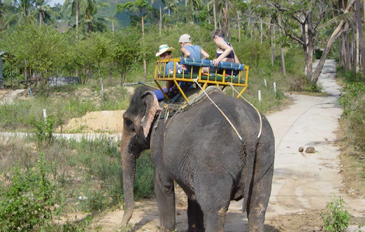 You can arrange tours from anywhere in Phuket Town or Patong and also at most hotels. The specialties of the South are the fiery, creamy, fish curries, often with prawns and the fresh fish mainly sea bass cooked in local herbs and spices. It's cheap to eat a great curry at one of the local restaurants and you can usually scout out tasty seafood by the beach, just avoid the touristy restaurants on the front in Patong, where the price triples for the same produce. This serves fresh fish in lime or curry sauce, oyster vegetables and a zingy Thai green curry. Prices range from 100-300 BHT for a dish, the produce is ultra fresh and the outside seating is perfectly situated by the sea. Fuangfa was a winner; this restaurant owned by a Belgian man, serves French and Thai food and is situated right next door to Six Senses on Rawai beach. The small and intimate atmosphere is quiet and peaceful, with the only noise being nature outside. Dishes include the delicious prawns in garlic and black pepper sauce, yellow curry, fillet steak with green peppercorn sauce and mashed potatoes and the fresh fish of the day. The restaurant owner was very attentive and helpful – he even gave us an after dinner cognac and a lift home. Although please don't expect this. Prices range from 80-300 BHT. For further information contact (01) 0520160. 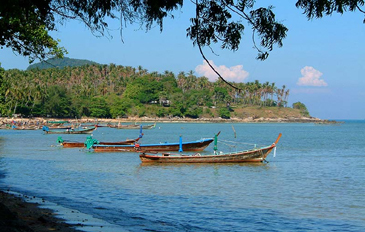 Evason is situated on tranquil Rawai beach, it's the perfect spot to really chill out and get away from it all. You may feel like an extra from a Bond movie as you approach the striking white tunnel at the hotel entrance. Resist any urges to scurry around with a pretend gun or you could raise a few eyebrows. Its tasteful d decor is created by local craftsmen and all the staff are locals. It's a huge five star hotel but it has been thoughtfully constructed and has studio rooms (at an affordable price), beach villas and apartments. Each room is geared around saving resources and being eco-friendly. Natural woods and white sheets are mixed together with earthy stone showers and each room has lemongrass scented organic products. The beach villas have the extra element of complete privacy. The Six Senses spa is a famous brand and its spa here is no exception. Facilities include sauna and steam and several treatment rooms for massage. The Energizer massage is an invigorating deep tissue massage which can be concentrated on a particular area, using aromatherapy oils to sooth away any aches and pains or tension accrued from daily routine. Afterwards, a pot of ginger tea by the ocean is just the ticket. For maximum benefits, using the sauna or steam after a treatment is the final touch. There are daily flights from Seoul to Phuket. The journey takes five hours. 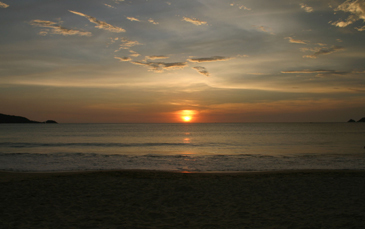 For more information or to book hotels or flights, contact The Tourism Authority of Thailand on www.tourismthailand.org or www.tatsel.or.kr. The website has lots of helpful information on planning the perfect itinerary.